One of Gavin Dudeney’s recent articles on this site explores the ideas of digital literacies and emphasises the importance of incorporating them into your teaching. This woman started shouting at her kid on the bus. You won’t believe what happened next! The worst things teachers say to their students: REVEALED!!! Ten reasons why your TV viewing will change forever. What to do when your best friend doesn’t know who you are! You won’t believe what this thirteen-year-old did on his holidays! Another alternative, if you wanted to extend the idea into a wider language literacy lesson, would be to work with historical events and to recast them as clickbait stories in the modern era. 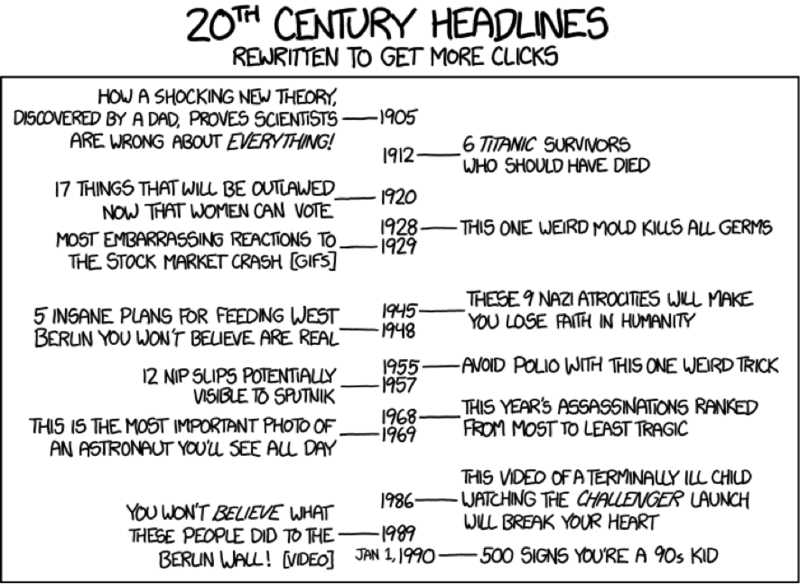 The satirical cartoon website XKCD has a great example of this (https://xkcd.com/1283/) – see if your learners can identify all these events, and then challenge them to write more for each other to identify. Using meme generators is a great way to get learners to play with both content and language. Sites like imgflip (https://imgflip.com/memetemplates) give you the most common meme pictures and the ability to caption them however you like. Some memes have particular structures associated with them. For example the character Fry, from the TV series Futurama, is often used with “Not sure if…. or….”, while the character Boromir from the Lord of the Rings film is associated with the sentence stem “One does not simply…..”. You can however, use meme generators as a way of practicing specific language points with any level of class. In simple terms, you set the parameters and the learners create the content. A further way to work with the content produced is to either feature them on a class blog, or they could be printed out and displayed around the classroom. Meme generators are often set up specifically to enable their users to share the content via social media, so learners could do this, though it would require them to share their social media identity with the meme site, which they may not wish to do. A word of warning, not all meme images are appropriate for all contexts, so you may need to discuss the appropriacy with the learners in advance. In a presentation I gave at the 2015 IATEFL conference, I suggested that we should revisit some of our approaches to the way reading is dealt with in the classroom because it doesn’t really reflect the way that our learners engage with texts. You can find more details on the talk and content on my blog, but essentially I suggest that we should ask our students, or get our students to ask themselves, questions that require a deeper level of critical engagement with the text than simple information extraction, though that is of course part of it. CONTEXT – in what context might you read this text? When and where are you? PURPOSE – why might you read it? Why was it written? REACTION – What’s your feeling when you read the text? What’s your emotional response to the text? Why? EXTRACTION – What information do you need to take from the text? Why? RESPONSE – What will you do with that information? What happens next? 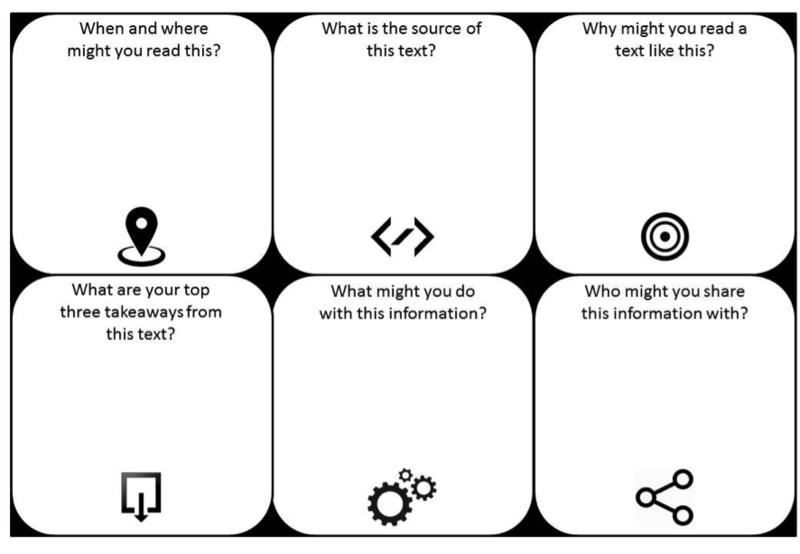 While this worksheet was developed to use with paper texts and course books, it could as easily be used with reference to web based texts, particularly with reference to some of the clickbait style texts as mentioned earlier in this article. It’s completely fine for learners to record negative answers to these questions, if for example, there is nothing they think is of value to extract from the text or if they don’t think they would share it with anyone. This though, can bring up useful classroom conversations: Do learners often read texts that they get nothing from? Is there an emotional satisfaction in reading some stories, even if there is no real informational content? How do they decide what they share with people and who to share it with? We all know about some of the more famous endangered species, pandas, elephants and whales – the cute and photogenic endangered – but you probably aren’t aware of the plight of the Pacific North Western Tree Octopus. This endangered species has a website dedicated to raising awareness of its plight, trying to get media attention on the story and to lobbying public opinion and politicians to do more to save this fascinating creature. I first became aware of this creature in a plenary talk by Nicky Hockley at the 2012 APPI conference, where she used the Pacific North Western Tree Octopus as an example of how we can build learners digital literacies. Did you know about the Pacific North Western Tree Octopus? Do you think people should help try and save it? What do you think people could do? Hold a brief discussion based around the class answers. Find five facts on the front page: http://zapatopi.net/treeoctopus/. Get content feedback from the class, write some of the facts on the board. How do they know these facts are true? What supporting evidence is given? Can they be verified elsewhere? Ask the students to try using a search engine on the term “Pacific North Western Tree Octopus” – what is the first listing? What are the next five listings? This should elicit the fact that the website is a hoax. Ask students to look at the website again, looking at the presentation and qualities of the website, essentially dividing these into two columns: (1) What does it use to look authentic? (2) How do I know it isn’t? If you have time and your learners have the inclination, there are now plenty of parody and spoof news websites like The Onion, The Poke and Waterford Whispers. These could form the basis of further reading and analysis work, but a more interesting and fun task is for the learners to try and create a short “news” item that could be published on one of these sites. Do be aware that not all of the content on these sites is suitable for all classes and contexts, so you will need to choose sample stories in advance. David Petrie is a teacher with the British Council Coimbra, a teacher trainer with International House OTTI on the Business English Teaching and Certificate in Advanced Methodology courses, and a print and digital materials writer and consultant to ELT publishers. He is DELTA qualified and has a MA Applied Linguistics & TESOL. Professionally, his interests mainly lie in the area of teaching exam classes and ways of using technology in teaching. He blogs about this and everything else ELT related at www.teflgeek.net and can also be found on twitter as @teflgeek.